In May 1972 I was offered a ticket to a Grateful Dead show at the Lyceum Theatre in London’s glittering West End. I was a student at the end of my 1st year at university, part of a generation of bright working-class kids, identified by tests at 11, separated from their peers, prepared for a well paid white-collar future. Social mobility, the safety valve of capitalism. I had an exam on the day after the concert & that seemed important so I turned the ticket down. Just a year further on down the road this chicken was less inclined to dance on their academic hotplate, the university could have carried on without me. 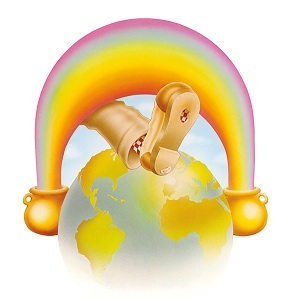 It’s tough to live a life without regret & I do still wish that I had seen the Dead on their “Europe 72” tour. In 1971, just 18 years old, I left home to study. I loved my family, still do, but one good thing about a small town is you know that you want to get out. It was an exciting time, new experiences with new people. I found that a most enjoyable way of spending my evenings was with good friends, listening to the Grateful Dead. If drugs were involved…well, it was going around. Up till then my music of choice of the proliferant psychedelic pack from San Francisco’s Summer of Love had been the jagged acid-rock of Jefferson Airplane & Quicksilver Messenger Service. The Dead’s 2 LPs of 1970, “Workingman’s Dead” & “American Beauty” introduced sweet vocal harmonies, greater structure to their blues-based improvisations & lyricist Robert Hunter, a non-playing band member, developed an appropriate, appealing, fancifully stoned take on past & present America. The group’s 2nd live double LP, “Skull & Roses” (1971), while only including 3 new original songs, consolidated their reputation as a stellar live act, a powerhouse of ensemble & solo musicianship, a Great American Band. This was West Coast music becoming more laid-back. Damn, I was horizontal most of the time & most of the time I was listening the the Grateful Dead. The document of that 1972 tour, a triple live LP “Europe 72” was never far from hand. “There’s nothing like a Grateful Dead concert” said the liner notes & we imagined that was true. “He’s Gone” is not the most immediately striking of Hunter’s new songs, that would be “Jack Straw”, er…”Brown Eyed Woman”, er…”Tennessee Jed”, er…there’s more. It references the disappearance of manager Lenny Hart with the band’s cash which caused his son, drummer Mickey, to take a 3 year long break from the group. This clip makes the cut here because of the contribution of organist Ron “Pigpen” McKernan. As the Dead integrated folk & country influences into their psychedelic rock & roll Pigpen remained committed to his R&B/Soul roots while his health worsened. His role in the band diminished & after this tour he was no longer able to continue. He unfortunately died, aged 27, in March 1973, much missed by the Dead & their fans. The group announced 3 dates at North London’s Alexandra Palace in September 1974, I had to be there. The gigs were in midweek, my ticket was for the Tuesday. I had finished my degree & had finally, after 16 years, stepped off the education treadmill. The forge where I worked would have to knock bits of metal about without me for a few days. My girlfriend had just started to teach & could not get the time off so I made the 125 mile bus journey by myself. I travelled early, on the Sunday, I had places to go & people to see. In 1971 Mickey & I, 2 fresh-faced, wet behind the ears Northern urchins had been neighbours who became good friends. We shared the 3 year long, strange trip of university life & I missed him being around. If I was going to see the Grateful Dead in concert then I wanted to do so with Mickey. How did he feel about it ? Well, I could ask him, he’s somewhere in this computer, but his long-term memory is shot to hell so I won’t. On a sunny late-Summer evening we were at Ally Pally (not a real palace) early. The imposing Victorian pleasuredrome, up in Wood Green, is set in parklands big enough to have its own racecourse. We grabbed a patch of grass & broke out the sticky splodge of hash oil donated by a musician friend (now a “national treasure”) when I told him I was going to see the Dead. Maybe a crafty microdot of LSD was considered. In a room with 5000 other people ? Not my scene man ! A good quality, high-content THC buzz would help the night along. We met up with Dave & Sue, friends from university, & entered the cavernous Great Hall to check out the unique “Wall of Sound” sound rig designed for the band by Owsley “Bear” Stanley, a man also known for cooking up a decent batch of acid. There were no seats, we positioned ourselves centre-stage, not too near, not too far & then…Bloody Hell, that’s Jerry Garcia over there ! This concert like no other started slowly. During “Around & Around”, the opening Chuck Berry jam, the band adjusted their own sound, the audience settled in for the long haul, wondering which of their many favourites they would hear in the 3-4 hour set. It was the 4th song, the traditional “Peggy O”, when the Dead hit their stride. Garcia’s beautifully clean & precise guitar & the familiar loping GD rhythm made it clear that it really didn’t matter what songs they played, this was going to be a great night. We got Bob Weir’s “Black Throated Wind”, Garcia’s “Loser” & the first set ended with 25 minutes from the “Wake of the Flood” LP (1973). For “Weather Report Suite”/”Stella Blue” the sound system made perfect sense, the band were locked into each other’s improvisations & the audience were getting themselves back to the garden. It was the long, familiar “Not Fade Away” which really got the second half rocking. Those live LPs, augmented by overdubs, are a full-bodied sound. In the room the extra space is filled by the propulsive, individual bass-playing of Phil Lesh, an extraordinary musician linking the rhythm section with the guitar explorations. 45 minutes into this set there was a crackle of anticipation from the audience. Maybe that microdot would have been a good idea. Too late to start now. “Dark Star” is the pearl of the “Live/Dead” LP (1969), the quintessential example of Haight-Ashbury acid-rock improvisation. It’s an open-ended jam, the greatest of their Greatest Hits & I’m running out of adjectives here. The band were playing it less these days, only 6 times in 1974 & it would, after tonight, not be played again until New Year’s Eve 1978. 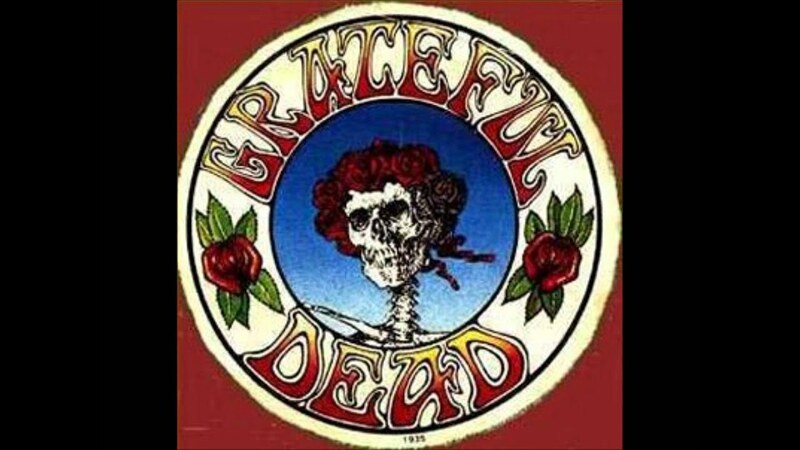 A segue into “Morning Dew” meant 45 minutes of classic Grateful Dead. An absolute “I was there” occasion. Blimey ! Whatever came next was all gravy. I do know what followed, the show is in my computer at archive.org with all the other Dead tapes. Stunned, stoned & satisfied we found ourselves in the open air. Sue pointed us towards her car & I oozed into the back seat. I think that we left a straggler behind. We were in no state to find him or he to stumble upon us. He’s OK, I’ve seen him since. That was some year 1974, the year I first saw the Grateful Dead (there would be other concerts but you always remember your 1st time). I finished with education, got a job, moved in with a lovely, lucky woman, we were married just a couple of months after this gig. Of course Micky was at the wedding, he was the best man (damn straight). Our invitations used a design from the sleeve of “American Beauty”, friends bought us a copy of “Europe 72” as a wedding present. OK, there’s no denying that I was a bit of a Dead Head back then. To tell the truth, I still am.